Virtual Reality and Vision Culture. Essay on the significance of virtual reality in a culture dominated by vision and visual phenomenon. Afterimage, vol. 20, no. 3, October 1992. Narrativity in Virtuality. Introduces video and film artists to new conceptual forms of interactive narrative suggested by virtual reality. National Alliance for Media Arts and Culture (NAMAC) Journal, January/February 1993. Incorporations: Zone 6. Book review of a compilation of writings on the ever changing relationship between humans interfaced and interacting with technologies. Afterimage, vol. 20, no. 9, April 1993. The Race for Cyberspace: Information Technology in the Black Diaspora. With Ron Eglash, Science as Culture, Volume 10, Number 3, September 1, 2001, pp. 353-374. 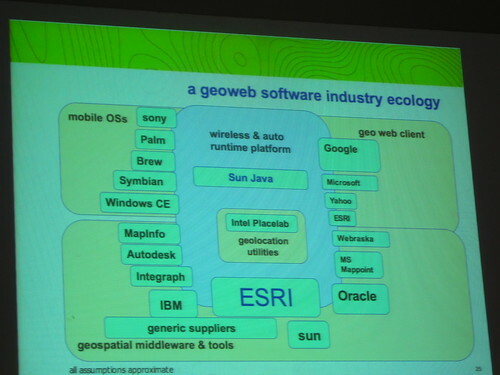 “A Design Approach for the Geospatial Web,” The O’Reilly Network, June 7, 2005. What’s Your Social Doing In My Mobile? Design Patterns for Mobile Social Software. WWW 2006 Workshop on Empowering the Mobile Web. Edinburgh, May 2006. Design Fiction: A short essay on design, science, fact and fiction. Independent essay on science and its reality effects through its fact and fiction idioms. March 2009. 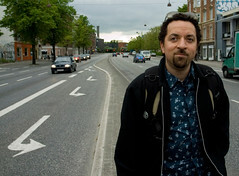 Julian Bleecker is a Research Fellow at the University of Southern California’s Annenberg Center for Communication and an Assistant Professor in the Interactive Media Division, part of the USC School of Cinematic Arts. Bleeckerâ€™s work focuses on emerging technology design, research and development, and concept innovation in the areas of pervasive media and mobile entertainment. His focus is on designing and prototyping technology-based networked applications that anticipate near-future forms of mobile and pervasive experiences. Bleecker has given talks and exhibited many of his emerging media and art-technology projects, designs and concepts in venues such as SIGGRAPH, Lift, Xerox PARC, Oâ€™Reilly Emerging Technology Conference, Oâ€™Reilly Where 2.0 Conference on Location-Based Technology, Ubicomp, Ars Electronica, ACM SIGCHI, ACM Advances in Computer Entertainment, Banff New Media Institute, American Museum of the Moving Image, Art Interactive (Boston), Boston Cyberarts Festival, Reboot, Eyebeam Atelier (New York City), and SK Telecomâ€™s Art Center Nabi (South Korea). Before joining USC, Bleecker worked as an entertainment technology consultant, creating mobile and networked applications for commercial entertainment clients. Bleecker has a BS in Electrical Engineering from Cornell University, an MS Eng from the University of Washington, Seattle, and a Ph.D. from the University of California, Santa Cruz where his dissertation was on the relationships amongst technology, entertainment and popular culture. My point was to indicate one of the important characteristics that I feel the editorial missed as it pitted experts against the wide-eyed, bushy-tailed novices creating Google Maps mashups. In a word â€” collaborative mapping. The ability for many hands, eyeballs, brains and sensibilities to contribute in a collective fashion to map making and world viewing. I’m going to start a new category â€” collaborative cartography. I may’ve read your dispatch wrong, but calling for GIS experts to stay at their posts suggests a kind of narrow perspective on what’s changing in the world of locative media and services â€” collaboration. Experts’ GIS systems for all their sophistication are far behind in their ability to provide the kind of massively multiparticipatory collaborative mapping that something as “basic” as Google Maps provides, right out of the box, and for a negligible cost. Pretty soon, if not already, GIS systems as we know them today will be as cranky and useless for their inability to dynamically correct through the collaboration of hundreds to millions of contributors. There’s no questioning the sophistication of a self-regulating social formation of many, many cartographers working on creating maps of everything that matters to them, including the infrastructure maps you privilege. I could map right now, without ESRI and for all to see, including my local water utility, the leaky main in the back alley. Is the guy in the public works office downtown going to be able to do that? Maybe yes..but why should it’s right here 30 meters from where I sit? Why do I blog this? I’m interested in the production of experts and expert knowledge. Not so much from the perspective of the knowledge itself, but mostly from the production of knowledge, how experts come to be experts, and how experts manage and police the boundaries between themselves and non-experts and the other way around â€” how non-experts situate themselves in relationship to experts and why. I’ve been thinking about using the Ephemera Cache as a framework for some kind of game experience. I’ll put together ideas off of the Ephemera Cache wiki page. Why do I blog this? I’m trying to think of ways to work through the one question this project brings to the fore: how can autonomous, motile networks create exciting and active social formations? So, I thought if I had a mobile, location-based digital media swap meet or blue gem game or something, I’d have the framework for an experiment that would give me some practice-based insights into what’s so curious about these ideas. Holly Willis wrote a piece describing the burgeoning digital art scene in Los Angeles titled LA Digital Universe in which she interviews myself, Perry Hoberman, Michael Naimark, Mark Allen and some others in the local tribe. Why do I blog this? The vanity angle is one reason, and the angle that good-press is good-news for someone who is sometimes orienteering towards art practices because it’s one way to do research at the edge of the innovation network. It also is nice to think that there’s a strong digital arts+technology scene in my new locale. It was hard to leave New York City because I thought I was moving away from an art-tech community that took me a couple of years to become part of. Kind of a closed boys world, it was. Almost like a frat. My new blog is trying to catch up with my new life. To that end, let me put up a belated link to my article on WiFi.Bedouin in Issue 2 of the online journal, Vectors., which is chock-full of other fascinating articles. I recommend you toast some marshmallows and settle in for some leisurely browsing. 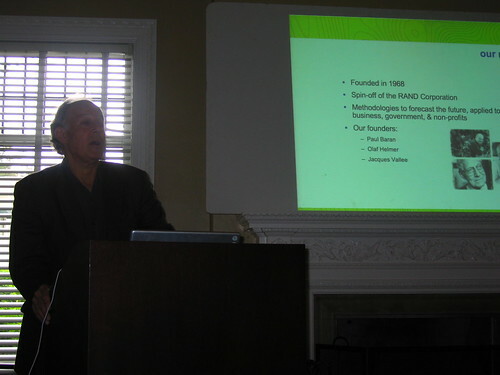 The following are my remarks on Michael Liebhold’s talk on The Geospatial Web, capture in my notes. Mike insights and thinking on the promise of the Geospatial Web, as well as the necessary systemic alterations in the current service/media/business ecology are fairly well articulated in his essay The Geospatial Web: A Call to Action — What We Still Need to Build for an Insanely Cool Open Geospatial Web. His talk on the topic of the Geospatial Web fills in some of the questions surrounding what the Geospatial Web is, as well as what would make it happen and what is preventing it from happening. My remarks on the talk pertain in part to what I think is the kernel of The Geospatial Web challenge: it is one of those bold visions tha’s as compelling as it is intractable in practice. Why is it intractable? Well, not intractable forever, but certainly exceptionally stifling to my own personal style of innovation — the late-night hack motivated by passion for some completely off the wall idea. 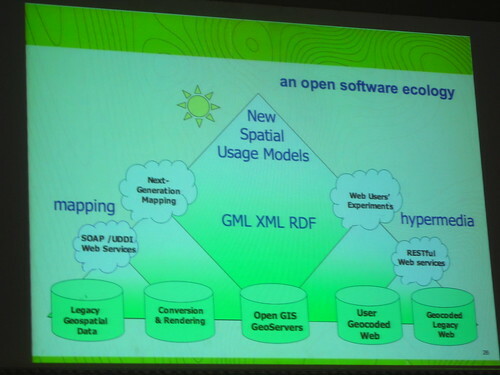 This is much of what Liebhold was referring to when he discussed the various “ecologies” that pertain to the Geospatial Web (see my talk notes). The Industry Ecology is made up of carriers, handset manufacturers, operating system developers, toolkit developers, business economics, content developers/deployers (media networks, apps developers, games developers), paying customers, with the carriers maintaining a somewhat heavy-handed authority over that kingdom. They own the customers, own the handset manufacturers in that they dictate what the handsets are able to do, dictate what operating systems will run on them, etc. Carriers are at the top of the “value chain” and want to stay there. But the value chain is untenable; it stifles innovation because the loop is closed. One palsied entity is dictating the terms of the entire ecosystem. But there are ways in. It’s not possible to imagine, really, that everyone in the carrier world is interested in stonewalling innovation, or that there aren’t insightful clusters of intelligence therein that recognize that the opportunity for sustainability and growth is not about charging customers a nickel to let them know where the nearest gasoline station is. One way in is to prove the business-economy case that open systems, cooperative practices and embracing the kinds of designed mobile experiences that are happening at the edges of the network are a viable, even necessary path to growth. Another approach I discussed with Liebhold and Francois Bar is the MVNO — mobile virtual network operator. These are “white label” mobile operators, contracting for network usage from the big carriers. Essentially, they are branding and marketing exercises — cobble together your own Service Ecology and try to sell it through to your demographic. Often times these MVNOs offer a unique suite of applications and services targeted toward a particular audience — it might be music downloads, push-to-talk, chat..whatever. I suggested that one way a carrier might experiment with an open style Service Ecology might be to develop their own MVNO — sort of like what United does with its Ted airline service. It becomes a way to run an idea up the flagpole, and see who salutes.